We are making a lot of progress! Upper cabinets are gone, the electrical is done, gas is piped in for the new gas range and walls as well as the door frames are prepped for painting. I had to sand the white bead board to knock off the gloss for the new paint. Truly, most of the hard work is done, its just a matter of getting to it. We are exhausted and ready to be done. I am thankful that we haven't run into any surprises during the remodel like many do. The lighting and new ceiling fan are all ordered. The cabinet hardware is here and the cabinets should be here in just a couple of more weeks. Next week, the new gas range and dishwasher will arrive. Soon we can get the countertop ordered. All the final decisions have been made, which is huge! I have fretted over every decision. I have been so anxious about making the "right" decision and keeping in budget. We do need to order a new door. The kitchen door is in terrible shape! The black stuff is the sealant from the window that leaks. I clean it off and then it comes back. All the dirt and grime sticks to it. So gross! I estimate that the door is over 25 years old. We discussed replacing the window and painting the door, but there were more issues that just the window, so replacing it just seems easier and wiser. This is the layout of the kitchen, except we chose to remove the cabinet above the sink area and we will put in a shelf there instead. Also, we decided against a farm sink. Too pricey and losing space under the sink was an issue for us. My big splurge was the 5 little drawers next to the sink. I love them!! I found this picture of a kitchen that has the same cabinets and laminate we are going to install. It has helped me to visualize what we are trying to get the kitchen to look like. Our goal is to have it done by the end of August. I am ready to have a sink back! Doing dishes in the living room with basins is getting old fast! I am so very excited for you!! Wonder what you are going to make first, in your new kitchen, once it is all done :)! 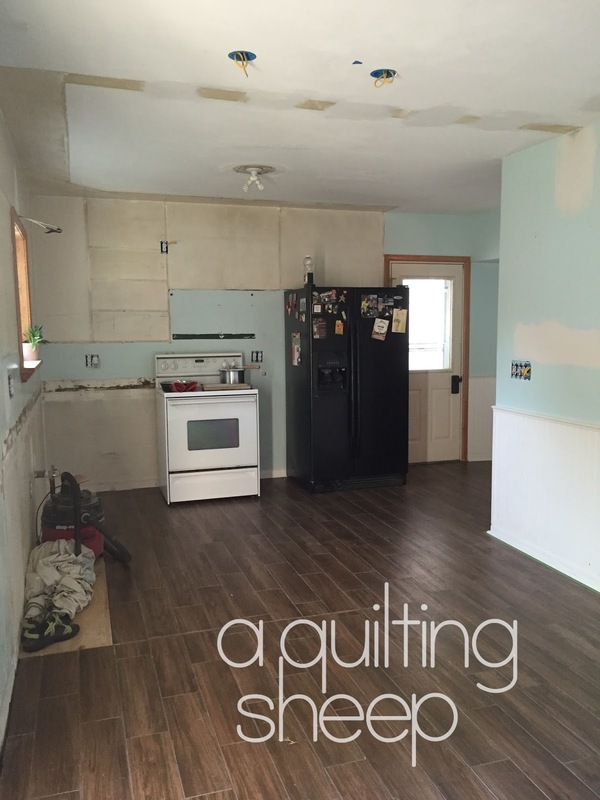 Your kitchen reno is coming along great! I love the cabinets and the laminate does not look like laminate at ALL! I like your kitchen plans. I like the white. I have been considering white cabinets too, or at least light I have the golden oak cabinets that everyone seems to have in their kitchen if it was remodeled in the 80's or 90's. What fun! I mean the pretty parts. Good choices to eliminate the farm sink; They look nice but not functional. A regular sink is just fine. I like more storage too. 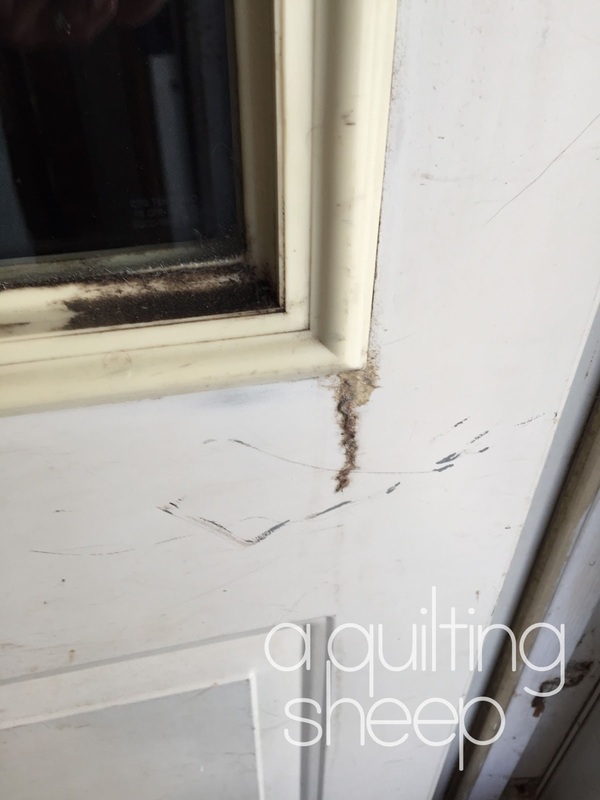 My house is only 17 years old and it has leaking windows and crappy doors. We have had a lot of repairs already. My kitchen is all white cabinets too. I used to sort of hate them, but now it is good. I have corian counters and I am quite happy with them. I do not really like granite bc your glass stuff can break so easily. Anyway. This looks epic stupendous. I know you miss your sewing room. Your fabric is sad, your sewing machine is sobbing quietly in to a clean white cotton cloth. Just think how on fire you will be to get back to it. Actually i got my new one just a couple of days ago :-) and i love it. Paper plates!!!! Saves most of the dishes during the remodel.